Below is a platform guide of the candidates’ main proposals. Candidates for SA president and vice president will elaborate on their platforms and discuss their ideas tonight in a debate moderated by The Dartmouth at 7:30 p.m. at Dartmouth Hall 105. Voting begins at 8:00 p.m.
Luke Cuomo ’20 is a government major and public policy minor from Long Island, NY. He has participated in Model United Nations and Dartmouth Democrats, but he said his most “applicable” experience is as the chair of the SA Finance Committee, an SA senator from North Park House, and as a member of the Elections Planning and Advising Committee. His running mate, Ariela Kovary ’20, is also from Long Island, NY and is a double major in history and psychology. She has been an undergraduate advisor, a graphic designer for the Aegis yearbook and a member of the Allen House executive board. On a database of syllabi for all classes: Cuomo and Kovary are calling for the creation of a website where syllabi from all classes will be accessible to students. Cuomo characterized the current system, in which students can request syllabi from professors or access them on some department websites, as “outdated and incomplete.” Kovary added that the policy would help students who work with the Student Accessibility Office find classes that are right for them. On sexual misconduct: Cuomo and Kovary state on their campaign website that they are calling for a “unified policy on sexual misconduct that would be applied to faculty, staff and students alike.” Cuomo said that every policy “should apply equally to all people who inhabit this campus” and that they would work with other groups on campus to “spearhead” this change. 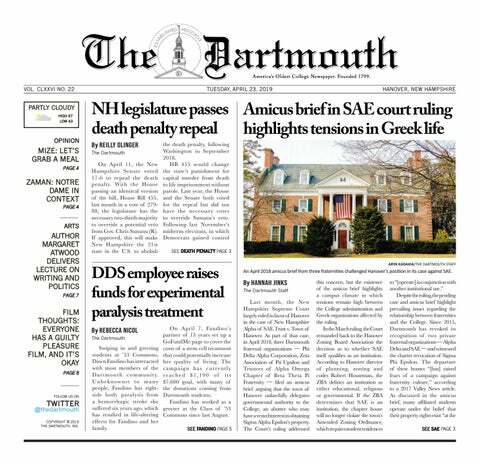 Dartmouth’s proposed C3I plan has already proposed a unified sexual misconduct policy, which is currently under review. They are also calling for all Greek organizations to follow one set of rules regarding repercussions for members that are found to have committed sexual misconduct. “There’s no singular protocol that states ‘this is the policy all houses should follow,’” Kovary said. On the Board of Trustees: Cuomo/Kovary posters call for “students’ voices and representation on the Board of Trustees.” Cuomo clarified that they are not calling for a student member of the Board — he sees that as a “non-starter” and “not a possibility” — but rather that the SA leadership should be allowed to “provide input on any major undertakings,” citing the proposed expansion of the undergraduate student body and the proposed dorm construction in College Park as examples of such undertakings. On subsidized bus tickets: Cuomo and Kovary propose a continuation of a current SA pilot program that would subsidize Dartmouth Coach tickets for low-income students using SA funds. If the program is successful, Cuomo said the program would ideally ultimately be backed by the College. Tim Holman ’20 is a government major from Cleveland, OH. He has been a member of the Hill Winds society, a tour guide and a SA senator from West House. He said that he has been interested in government since childhood and joined SA upon arrival at Dartmouth. On Internship funding: Holman is calling for a centralization of all internship funding. He said this proposal could initially take the form of a list of funding sources on the SA website, but Holman also called increased funding “a tenable goal.” He said that current funding sources are “simply not enough” for internships in major cities, especially for students from low-income backgrounds. On the Center for Professional Development: Holman said that students who aren’t interested in finance and consulting “find it very hard to find internships at the CPD.” Citing a frustration with the feeling of a “pipeline” to Wall Street, he proposes encouraging the CPD to “pay more attention to other areas besides finance and consulting to bring those opportunities to the forefront for students.” Holman also suggests cooperation between the Dartmouth Career Network and the CPD. On food insecurity: Holman said he wants to work with the Office of Pluralism and Leadership and the First-Year Student Enrichment Program to “give support to members of the community, those who come from low-income backgrounds.” He suggested that these organizations need more support, recognition and funding. On sexual misconduct: Johnson said she wants to see more “actionable items” from the administration on the issue of sexual misconduct. She says “there is only so much we can do on the education side,” but she does not yet have “concrete changes” that she wants to make. Correction appended (April 15, 2019): The first paragraph of this article originally stated that Holman and Kovary are running on the same ticket. That has been updated to reflect that Cuomo and Kovary are running together, which had been correctly stated in the remainder of the article.